Master Clock Generator is capable of high precision digital processing, sending 10MHz clock signal for further enhanced sound quality. TEAC CG-10M Master Clock Generator maximises the performance of all compatible units such as USB DAC, network player and CD player that deliver high-res playback. The clock signal is the basis of all its functions in digital signal processing. It is even more in the DSD audio signal where the time axis operates at MHz speed. Therefore, by making the master clock which is important for high-resolution sound source reproduction high precision, it becomes possible to obtain performance faithful to the original sound. Minimising the temperature change to zero stabilises the oscillation accuracy. OCXO (Oven Controlled Crystal Oscillator) has a thermostat to maintain the temperature. This makes it possible to generate a clock signal with high precision at all times. OCXO has high spec of frequency change due to temperature change, frequency accuracy indicating quartz oscillator performance. 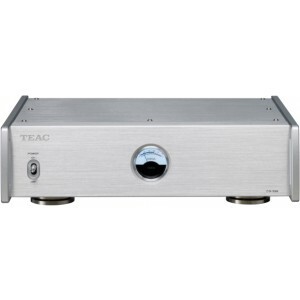 TEAC aimed for the master clock generator’s optimum performance used for listening all the time, and adopted not only the frequency-temperature characteristic but also the one with excellent frequency ageing and phase noise characteristics. Equipped with four gold-plated BNC terminals (50 Ω) so that clock signals can be supplied to multiple devices. Up to 4 units of 10 MHz clock input compatible devices such as USB DAC, network player, SA-CD player etc. can be connected in parallel. For each system, the circuit from the power supply to the buffer amplifier and the output terminal is a completely independent circuit configuration. Mutual interference when multiple units are connected to the outside is eliminated as much as possible. By providing a buffer amplifier in each circuit of the system, dividing the generated clock signal into four, the original high precision 10 MHz clock signal is transmitted to all the BNC terminals Output. The Oven Status analogue metre in a simple design always displays the oscillation state inside the crystal oscillator OCXO. An installed metre luminance adjustment function matches the luminance of peripheral audio equipment. Adopting a large-capacity toroidal core power transformer that always supplies a stable current, the stable operation greatly contributes to the generation of clocks that are important and the output of high-precision clocks. A three-point support type leg enables stable installation of the main body unaffected by the slight distortion of the floor surface. By supporting the main body only at a very small point, it reduces vibration and resonance, thoroughly eliminates mid and LF distortion for a resolution and sound image localisation that emphasises the soundstage. CG-10M features an aluminium panel similar to the Reference 500 series in an A4-sized metal chassis that efficiently blocks radio noise. Combined with UD-503, NT-503 etc, it is easily fitted into the vacant space of an audio rack and effective space saver when connecting with full-size machine.